PPG Industries recently announced the launch of its new sustainability vision, values and goals issued in the 2012 PPG Corporate Sustainability Report.Leading up to 2020, PPG will strive to reduce environmental impact, improve employees’ safety, health and well-being and encourage and report employee charitable donations and volunteerism. – Achieving 30% of sales from sustainable products by 2020. “Since PPG’s founding 130 years ago, sustainable business practices have been embedded in our culture and strategies, helping the company achieve lasting success for our customers, our employees, our shareholders, our neighbors and our suppliers,” said Diane Kappas, PPG Vice President, Environment, Health and Safety. “This year, we have taken a significant step forward as we provide employees across the globe with a pathway and measurable targets to advance our continually evolving sustainability practices to address what is most meaningful to PPG stakeholders.”The report is self-declared to meet Global Reporting Initiative (GRI) G3 Application Level B requirements. 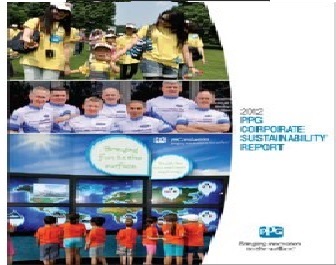 PPG is scheduled to publish its next sustainability report in 2014, which will report on performance in 2013.